September is an exciting month in the allotment, not least because it’s the perfect time to start harvesting kale. While 2015 may not have been the most productive for Scottish fruit and veg growers, kale, which is often described as Scotland’s national vegetable, is still thriving, and brassicas overall appear to have not done too badly – particularly in comparison to the legumes which have had a bit of a tough time. Kale has become a ‘cool’ and much talked about vegetable over the past couple of years because of its superfood properties – it’s full of antioxidants and has high levels of vitamins A and C – so it’s a good idea to get a regular fix of it. I sometimes find that the kale available in supermarkets is a bit on the old and woody side, so it’s nice to grow your own and be able to pick some young and more tender leaves. Last year I grew curly kale which came up in abundance and lasted from September right through until February. This year I opted for black Tuscan kale – also known as Cavolo Nero – which is a smooth variety with dark green, almost black, leaves. While Ken Cox recommends waiting until after the first frost before you harvest, I’ve been unable to resist… however I must say the two helpings I’ve had over the past week or so have been delicious and not at all bitter. The thing to remember is that the more you cut your kale, the more you get in return. It’s great to get the early baby leaves which are more tender and sweet – the larger, woody leaves are still delicious but should be cut up the middle to remove the woody stem before cooking. Heat oven to 150C/130C fan/gas 2 and line 2 baking trays with baking parchment. Wash the kale and dry thoroughly. Place in a large bowl, tearing any large leaves into smaller pieces. Drizzle over the oil, then massage into the kale. Sprinkle over the ras el hanout and some sea salt, mix well, then tip onto the trays and spread out in a single layer. Bake for 18-22 mins or until crisp but still green, then leave to cool for a few mins. Heat the oil in a large wok, then add the kale and a couple tbsp water. Season, then stir-fry for 5-8 mins, adding the garlic and chilli for the final 2 mins. 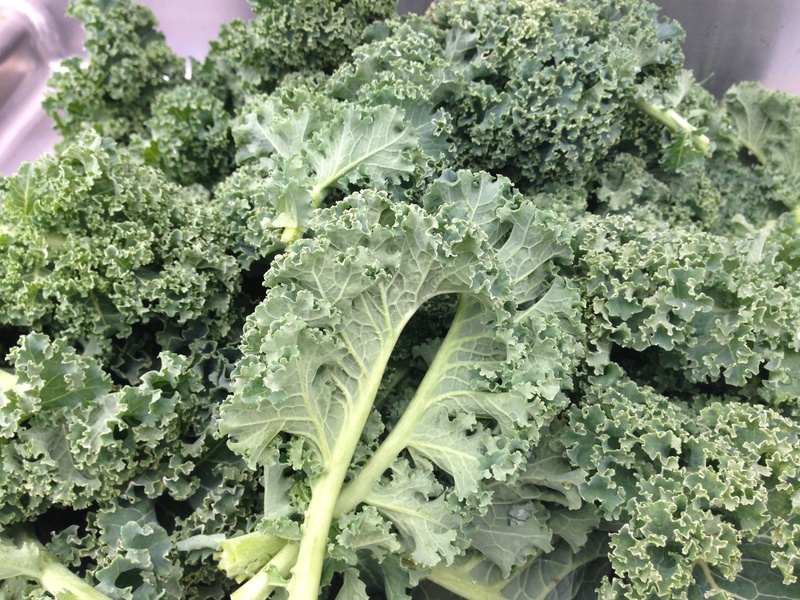 When the kale is tender and a vibrant green, remove from the heat and serve. In a large bowl, combine flour, baking powder, garlic, and salt. Stir in kale and feta cheese. In a medium bowl, whisk oil, eggs, yogurt, and milk. Pour into dry ingredients and mix until well combined. Pour batter into loaf pan and sprinkle with walnuts. Bake 45 to 50 minutes, or until a toothpick inserted in centre comes out dry. Let sit 10 minutes, then remove to a wire rack to cool completely.